Goodreads Synopsis: Zeus has punished his son Apollo—god of the sun, music, archery, poetry, and more—by casting him down to earth in the form of a gawky, acne-covered sixteen-year-old mortal named Lester. The only way Apollo can reclaim his rightful place on Mount Olympus is by restoring several Oracles that have gone dark. What is affecting the Oracles, and how can Apollo do anything about them without his powers? I had a bit of trouble getting through this book, to be honest. I love Rick Riordan and I adored the first book of this series, but this one was tough. 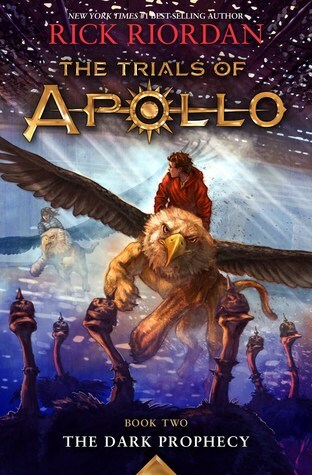 Apollo was one of my favorite gods in the Percy Jackson series, so I was stoked when this series came out. Apollo is funny and snarky, but also a little self-loathing. He's used to getting whatever he wants, whenever he wants...which is why he's in this situation in the first place. The first part of the book was a little slow to get into. There's some new characters and a lot of banter that happens, but it just wasn't enough to hold my attention. Like I said, I love Apollo but I just kind-of-liked this book. There's a lot going on in this book and it was a little hard to keep it all together. One thing I always love, however, is watching a character grow and change. Apollo, as Lester, is a bit of a coward. He's mortal and it scares him, so he doesn't put himself out there as much as he should. I feel like we get to see a different side of Apollo as the story moves, which is a good thing. He comes a long way from hiding behind Calypso to sacrificing himself. Another thing I love (a lot) about Apollo is how open he is open his sexuality. Apollo has no problem talking about the women or men that he's been involved with in his four-thousand year existence. All in all, I'm enjoying this series and I'm looking forward to getting some answers in the next book. Maybe I'll go through this one again and see if I feel any different about it.